Cebu Pacific Promo Fares 2019 to 2020: 75% Off Promo On All Domestic Destinations! 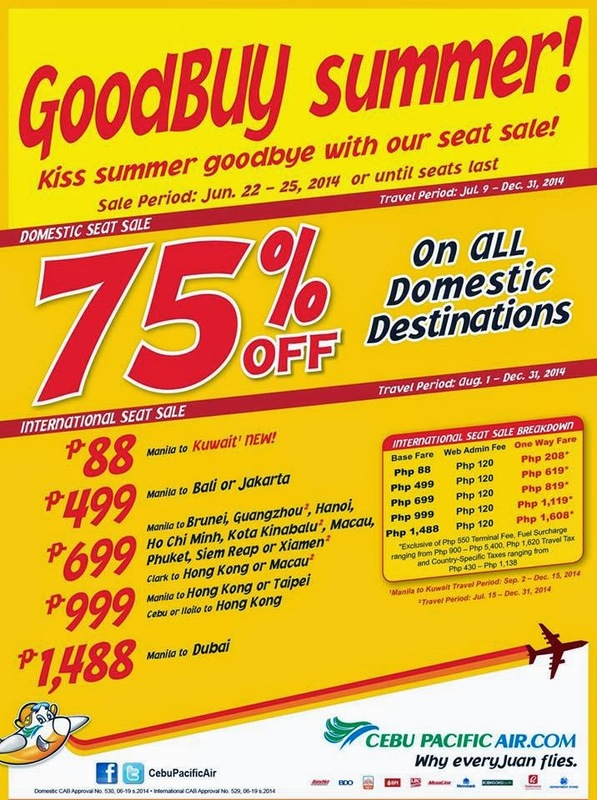 Cebu Pacific Promo Fare: GoodBUY Summer! Kiss summer goodbye with our latest #CEBseatsale! 75% OFF discount applicable on DOMESTIC fare only inclusive of 7kg hand-carry baggage allowance. The following fees shall apply after discount: Php 120 Web Admin Fee, Fuel Surcharge ranging from Php 200 - Php 550, Terminal Fee ranging from Php 50 - Php 200, and check -in baggage. Quoted INTERNATIONAL one way fares are inclusive of Base Fare, Php 120 Web Admin Fee, and 7 kg hand-carry baggage allowance but exclusive of Php 550 International terminal fees, Php 1,620 Philippines Travel Tax, Fuel Surcharge ranging from Php 900 - Php 5,400, Country Specific Taxes ranging from Php 430 – Php 1,138 and check-in baggage. Promo fares have limited availability and are non-refundable but rebookable subject to the following rebooking fees: Php 1,200 for Short-haul International destinations and Php 2,500 for Dubai plus fare difference.. Please note that booking fee rates range from Php 120 - Php 200 depending on purchase channel. For your convinience, flight changes availing of prepaid baggage allowance for check - in baggage and web check-in service can be done up to 4 hours before scheduled flight. good day may i ask if the promo flight manila to bali indonesia is on promo on octoctober 14 to october 21 flight? August 8 to 10 flight promos?